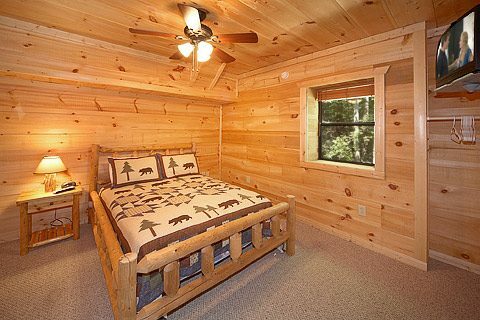 "Bear-rif-ic,"a Pigeon Forge 2-bedroom cabin off the spur decorated with custom log furnishings, places guests conveniently between Pigeon Forge and Gatlinburg at Sky Harbor Resort. This 2-bedroom cabin with Internet access comfortably sleeps up to 10 guests and boasts all the comforts of home. 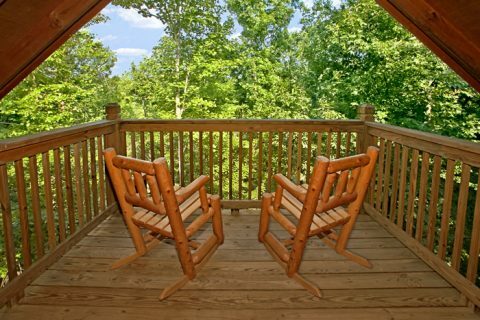 Stay connected with friends back home as you enjoy your five-star cabin rental escape in the Smoky Mountains! 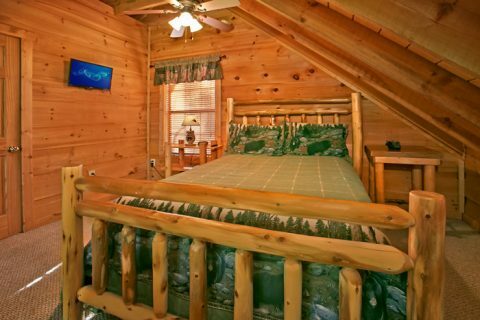 With its centralized location between Pigeon Forge shows, Gatlinburg attractions, and proximity to the entrance of the Great Smoky Mountains National Park, this Pigeon Forge 2-bedroom cabin off the Spur gives vacationers the accessibility they desire while maintaining the feeling of a peaceful mountain retreat. 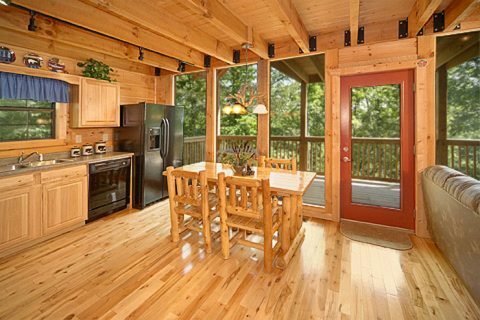 Step into your five-star cabin rental to discover your cabin home away from home. 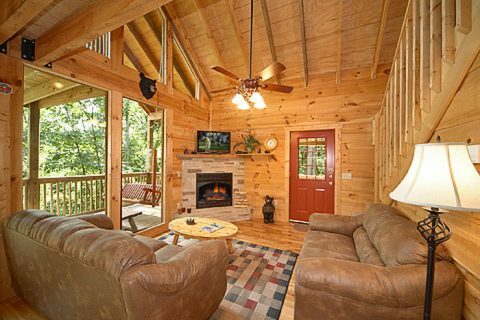 Entering into the living room of this Pigeon Forge 2-bedroom cabin off the Spur, guests are greeted with large, comfortable couches and a beautiful gas log fireplace. 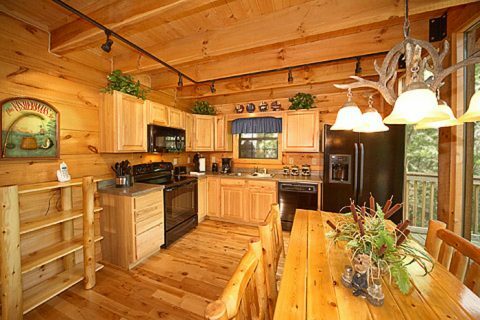 The chef in the group can whip up snacks and holiday meals with ease in the open, dine-in kitchen with plenty of cabinet space, a dishwasher for easy cleanup, and a handsome log table. 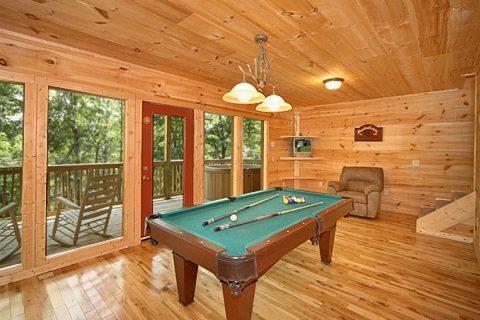 While dinner is being prepared, the rest of the group can enjoy the relaxing waters of the hot tub, watch television on the flat screen television, or partake in some friendly competition at the pool table. 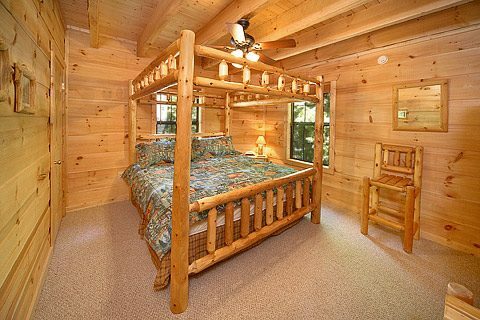 When it's time to turn in for the night, there's plenty of space in this five-star cabin rental for everyone to get a restful night's sleep before their next exciting day in the mountains. 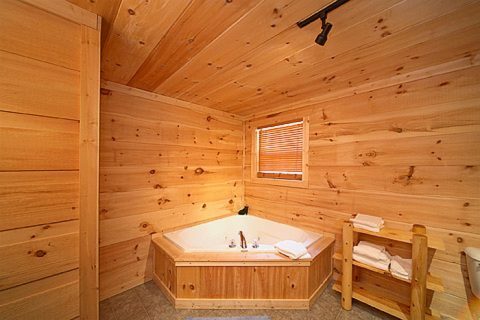 The master suite offers an expansive king-sized bed and a jacuzzi tub in its full bath for added relaxation. 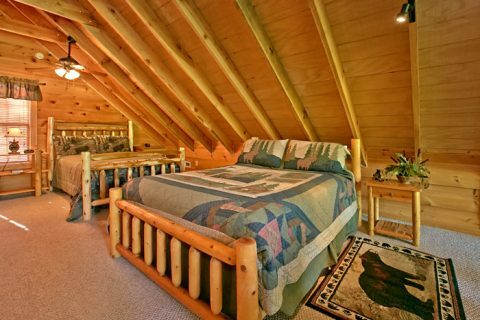 Downstairs, a queen bedroom and a futon provide additional sleeping space for 4 other people, while upstairs, the loft bedroom offers a queen bed and twin bed as well as a private deck to enjoy the mountain views. 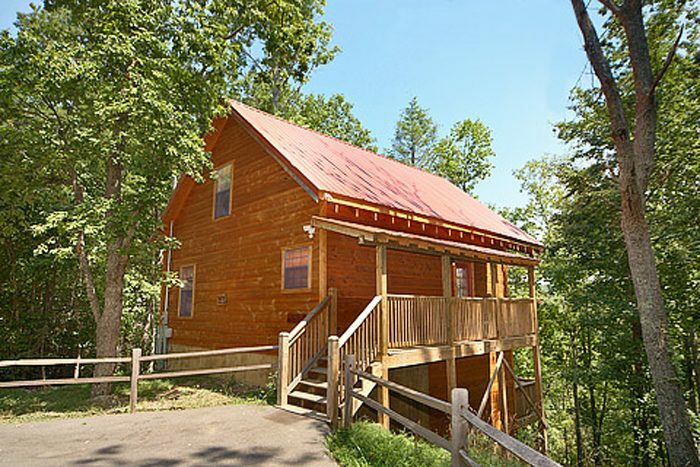 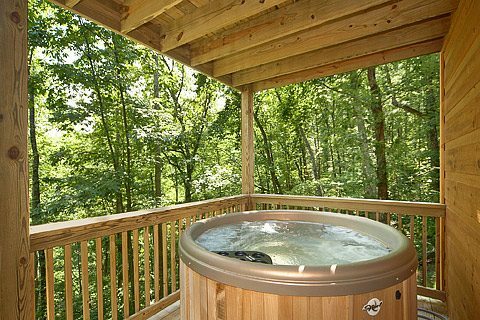 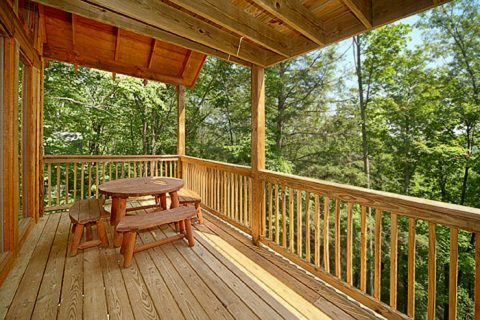 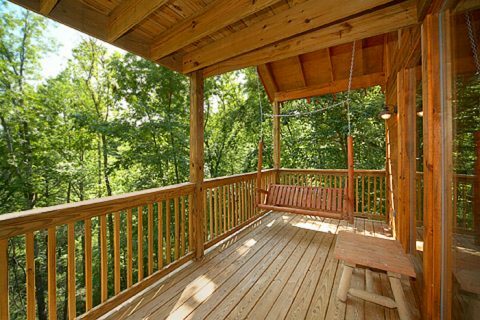 Make plans for your "Bear-rif-ic" cabin stay in the scenic Tennessee Smoky Mountains at this beautiful Pigeon Forge 2-bedroom cabin off the spur today!